Well, retailers didn’t even wait until Thanksgiving to entice holiday shoppers to part with their money. Unfortunately, their ploys, including opening as early as 6 am on THANKSGIVING morning (KMart) and a number who offered Black Friday savings before Thanksgiving, failed to work. According to the New York Times, sales for the holiday weekend — Black Friday, Small Business Saturday, and Sunday, were down over 11% from last year and average sales per person (AOV in marketing parlance) were off as much as 10.2% online and 6.4% in stores. That’s pretty disappointing to merchants who expected holiday sales to top last year given the improving economy and low gas prices. While folks at the National Retail Federation stand behind earlier estimates calling for a strong holiday season, others aren’t so sure the first official weekend of the holiday represents a fluke. Are shoppers tired of disappointing Black Friday sales? Are customer boycotts because of Thanksgiving openings cutting into sales? Are customers simply avoiding the stampedes and fights to get discounts on a few items? Are customers avoiding long lines to get into stores and pay for merchandise? According to the National Retail Federation, any or all of these might account for low holiday sales. So might consumer confidence, which has rebounded nationally, but might still dampen some shoppers still reeling from job loss, bankruptcy, and foreclosure. Might there be other causes for poor holiday sales? As one of the millions out there trying to find a few good discounts on Black Friday, it seems to me another explanation involves ignoring connected consumers who represent a large portion of American buying power. their behavior is noticeably dissimilar to that of their traditional counterparts. The connected customer is the stranger you must get to know as in comparison to the customers of the past, this group is only growing and it’s traversing demographics. As such, the connected customer becomes what we can or should now refer to as Generation C where the “C” represents connectedness. In his book, The End of Business as Usual, Solis depicts connected consumers as a lifestyle, not a demographic. In fact, Solis contends, and I concur, connected consumers exist in every demographic, although they’re a little skewed toward women. Rather than developing strategies to capture the elusive Millenial, Solis argues businesses need to understand and satisfy the needs of connected consumers, a group larger and with more buying power than Millenials alone — although a large percentage of Millenials are connected consumers. And, the power (and number) of connected consumers is expected to grow dramatically. Today’s infant is on Facebook within hours of her birth (and even before as parents posts sonogram pics). Toddlers master touchscreen technology with surprising ease, making them the most tech-savvy generation yet. But, don’t get fooled into thinking connected consumers are all young. Increasing tech usage among all age groups shows that connected consumers are increasingly likely among Baby Boomers who’s increased digital footprint shows they are developing digital mastery. Connected consumers represent a global phenomenon, as countries leapfrog into digital technologies — eMarketer data shows most industrialized nations will reach 50% smartphone saturation within the next few years, with many already above the 50% saturation point. Connected consumers are omnivores when it comes to consumer information. In fact, connected consumers are consummate multi-taskers, often consuming information simultaneously on multiple devices and sites. For instance, they might watch TV with a laptop, tablet or smartphone in their hand (or on their lap), thus interacting on social networks while consumer broadcast programming. They shop while watching a video on YouTube. They check email while downloading a new app. Connected consumers aren’t satisfied with shopping online or in stores. They want m-commerce or mobile commerce consisting on e-commerce, social networks (for recommendations), and apps like Groupon, Yelp, and store apps. They compare prices posted in stores with those available online, they explore products in stores, then order online, they shop online then purchase in stores. So, businesses, especially retailers, need a strategy designed for these connected consumers if they want to retain their profitability. Otherwise, connected consumers simply move on to businesses willing to help them reach their goals. Knowing a little about connected consumers, let’s think about strategies for attracting connected consumers. In general, strategies rely on integrating online and offline marketing efforts to form a single, seamless strategy. Many retailers feel threatened by such integration, fearing hyper-competition results when they ease consumer efforts or that integration causes increased costs or confusion internally. But, what retailers don’t understand is there is NO option. You either cater to connected consumers or lose them — ignoring them means you’re behind the curve when your competitors develop strategies that appeal to these consumers. Today’s shoppers want the best deal for their money so many use their smartphones while shopping to check prices at other local retailers or online stores. They also want the ability to shop in stores, but purchase a product online when the store doesn’t offer the right size or color or when the product is bulky or for delivery as a gift. Make it easy for them to interact online by increasing in-store connectivity — especially in malls where stores often have little or no WIFI service. Use QR codes or other devices that make it easy for consumers to find your products online by simply scanning the item and placing an order. QR codes also make it easy for shopping to get additional product information or share potential purchases with friends on social networks or via texts to get opinions that motivate purchase. Google uses context — device, location, time — to deliver on what the consumer needs quickly and efficiently. Retailers should use similar context to deliver the right message to the right device at the right time. For instance, on a mobile device, a consumer likely wants a store locator, map integrated with Google maps, or a phone number to reach the store rather than a traditional ecommerce site. On a computer or tablet in a stationary location, they’re likely more interested in a traditional online shopping experience. 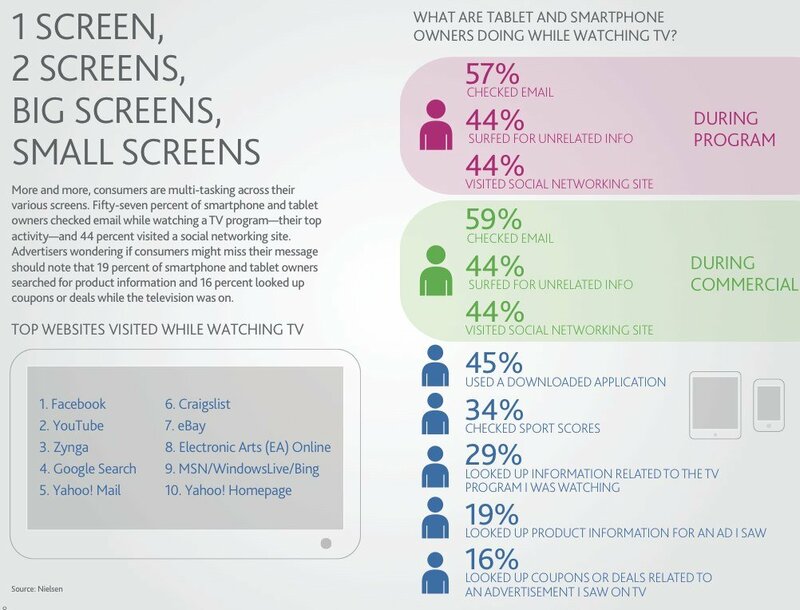 According to Nielsen’s study, consumers want integration across devices. So, when I search for an item on one device, I want to easily transfer to another device without having to start my search again. When purchasing a new computer for a client, we encountered a serious problem with HP’s mobile site, which didn’t offer customization, but required we use their computer version. Unfortunately, when we opened up the computer site, we had to begin our search all over again. Make it easy for consumers. A good example is Amazon. I buy a book and can read it on any device. Getting consumers to download your app is increasingly difficult because there are so many competing apps and many offer little value. For instance, you should allow access to online shopping, coupons, and special discounts to those using your app. McDonald’s offers a free burger when you download the app and discounts to encourage visits. Macy’s recently added coupons to their app to reduce frustration by shoppers who didn’t have the paper coupon. Recognize using an app to retrieve coupons in the store requires enhanced connectivity (see tip #1). Don’t limit your integration efforts to communication. Think about integrating fulfillment across devices and sites. For instance, the ability to return products purchased online to a local retailer is high on the list of priorities for online shoppers who hate having to pack up and return online purchases. Also, allow customers purchasing online to pick up in their local store when they want something quickly.